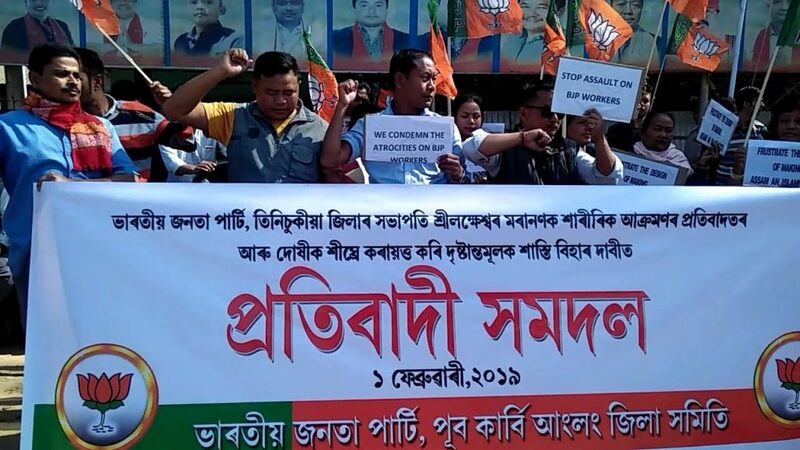 A protest demonstration was held on Friday in Diphu in Assam’s Karbi Anglong district at the office of the BJP, East Karbi Anglong District Committee (EKADC) in protest against assaulting a BJP worker in Tinsukia on Wednesday last and demanded the arrest of the culprits involved. BJP president of Upper Assam’s Tinsukia district Lakeswar Moran was beaten, his hair pulled and push to the ground by protesters who were against the Citizenship (Amendment) Bill, 2016. Meanwhile, protest against citizenship bill continues in Karbi Anglong district. Karbi Anglong District Congress Committee (KADCC) burned effigies of Prime Minister Narendra Modi, national BJP president Amit Shah, union home minister Rajnath Singh and chief minister Sarbananda Sonowal and Assam finance minister Dr Himanta Biswa Sarma in protest against the Citizenship (Amendment) Bill 2016, in front of KADCC office on Friday in Diphu.